On a South Africa holiday at Kololo Game Reserve, guests can relax on the restaurant deck and watch large game roaming on Welgevonden. For an inspiring South Africa holiday and eco safari, Kololo Game Reserve provides a superb natural environment to hike, bike and drive in whilst spotting game, birds and fabulous flora. Mountain bikes are provided and picnic baskets filled with goodies can be arranged by the restaurant at Kololo. For an exciting South African safari experience, game drives and guided walks are offered by the resident game ranger who will gladly share his knowledge of the natural environment. Children of all ages are welcome to join in on a lovely game drive. If you are lucky, you might spot the African Big Five - elephant, rhino, buffalo, lion and leopard. Savannah Horse Trails offers a unique and wonderful opportunity for guests to witness the allure of the reserve on the back of a horse. Discover the unparalleled beauty of the Waterberg Mountains during a horseback excursion and view the magical savannah plains, river valleys and rocky plains. Kololo has entered into a joint venture with the Leopard Conservation Project, who will have a research station on the game reserve for monitoring these reclusive big cats. This is a unique opportunity for guests to get close to these magnificent animals and participate in their protection. Kids can embark on guided walks with a ranger and learn how to track wildlife. The importance of water to humans and animals are taught on a river exploration, and kids can learn all about the aquatic creatures. An early dinner is followed by a night drive and an evening under the stars, where kids can enjoy hot chocolate as the guide tells stories about the constellations. Kololo Game Reserve provides a wide range of activities. Go horseriding, hiking or biking and explore the Waterberg Biosphere in Limpopo during a guided walk. 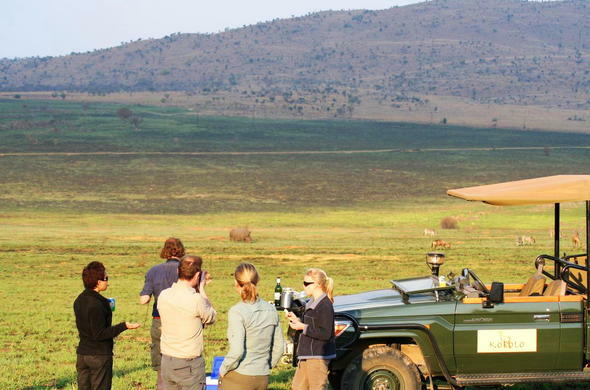 Go on an exciting game drive during your South Africa holiday in Kololo Game Reserve. This Limpopo reserves also offers a ranger training course and other excursions.